What an awesome day it was today! Although I had to make sure I was up early to prepare for a meeting with a recruiter and an interview with a potential employer, this day turned out much better than I had thought it might. I spent a couple hours preparing for my meeting with my eighth recruiter, by researching their company, and making sure their focus and goals match my needs as I continue my hunt for a new job. It is imperative that you know as much about your recruiter as they do about you. You need to know if they are reliable, if they have a good track record, and if they are going to hustle to help you when they need to. This latest recruiter has already proven herself with me, as she had lined up two (and possibly four) interviews for me before she even met me face to face. She has proven that she is determined to help me find a job and it’s evident by the quality of interviews I am getting through her that she has some connections. I had an hour and a half between the meeting and the interview, so I spent that time researching the company that was conducting the interview. The interview ended up being a lot more technically intense than I thought it would be. They asked me a lot of questions regarding the technologies I am familiar with and how I would handle specific events if they occurred. My strongest asset is my ability to adapt, and I adapted quickly to the type of interview it became and I really think I nailed it. I spoke to the recruiter again after the interview and she should hear something by Monday, then I will know if they will conduct a second interview to meet me in person. I should also find out about two more potential interviews on Monday, so keep your fingers crossed and say your prayers. After all my work was done today, I spent the afternoon on our back deck with our oldest son bird watching and taking photographs. We were shocked when we saw a bird we have never seen before sitting in the tree above our house. 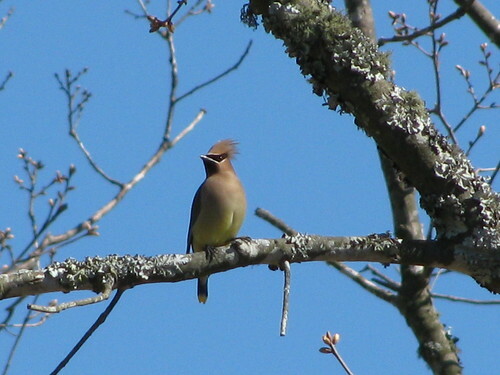 This is the Cedar Waxwing, which is a migratory bird that is only in Georgia for a few months during the winter. In addition to the waxwing, we saw our regular cardinals, bluebirds, sparrows, finches, and other assorted avian friends too. The photo at the top of this post was taken on our way to pick up dinner tonight. We saw the red-tailed hawk flying above some trees off the highway and pulled over to get a couple photos. That bird was very far away and appeared as just a speck with the normal eye. The zoom lens on this new camera is awesome. If you could have seen how far away that bird was, you would understand why it’s a little grainy. That’s it for today. We might be heading over to the fifth annual Red Nation Pow-wow tomorrow, which will be a lot of fun.